With a total arm length of 310mm (over 12) and 210mm ( 8.3 )arm space right of the needle, this machine is ideal bigger projects and yet is equally suited to precision sewing, offering 71 needle positions for precision sewing. It has a superior feeding system comes with a semi-rigid cover. 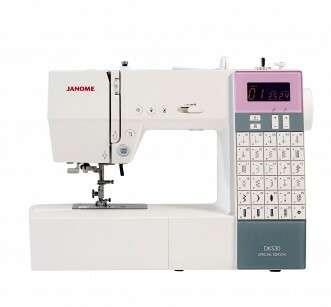 This machine has all the features to make sewing simple & enjoyable. Fully computerised with a host a great features including Janomes new easy set bobbin system this machine ticks all the buttons. With each stitch having its own illuminated selection key and stitch width & length adjustment keys located just under the screen it just couldnt be easier. Theres even a special key which enables some stitches to be elongated up to 5 times normal without losing stitch density ! Theres plenty of accessory storage and a hard cover for protection.